Superman 38 was quite the intense issue. The hype around Superman’s new power isn’t the only thing to get excited about in this issue because the ending was just as exciting. So lets discuss Superman 38! So the whole Ulysses arc has come to close. Supes being the nice guy he is doesn’t view Ulysses as a villain or his enemy, he just understands his longing to have a home. But Superman has gotta do what he’s gotta do, and take him out. And take him out is what he did…with his brand spanking new power oh yeah! But what is Superman’s new power? 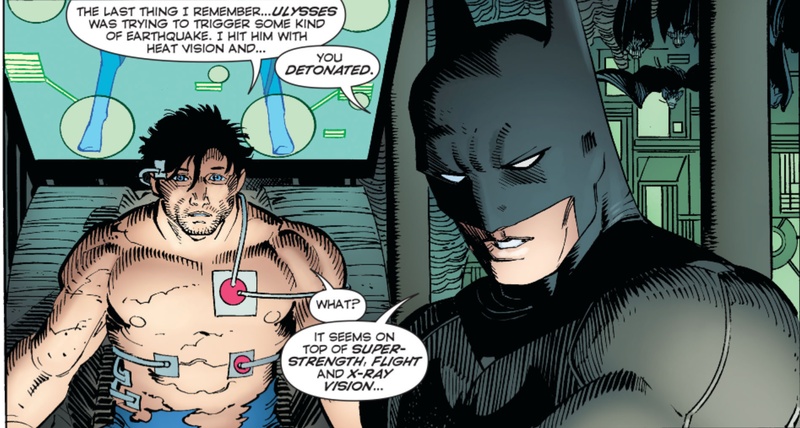 Well Batman explains it that Superman’s heat vision was just a precursor to another ability Superman had yet to develop. The ‘Super Flare’ as Bruce calls it is his new power, in which Clark is now able to unleash all the energy stored in every single one of his cells creating a solar flare. However after he unleashes his super flare he no longer has any powers for around 24 hours, to allow for his energy to come back. Now everyone’s been saying, “oh because what Superman needed was yet ANOTHER power” but to be fair, the New 52 hasn’t made him as over powered as he was before. He can’t create mini versions of himself anymore, so I think it’s exciting that the New 52 Superman has gotten another power. And it’s not crazy and random, it makes sense with the other powers he has. It keeps the story fresh and exciting, without repeating the same old Superman story over and over again. New power equals the opportunity to tell interesting new stories, with Superman 40 showcasing the Justice League reacting to Superman’s new intense power. Superman is also getting a new costume which will officially debut in next month’s issue. We’ve already seen the image of it, but really you can’t tell if it looks good or not until another artist draws it, because like many other people I’m just not a fan of John Romita Jr’s art. Though in Superman 38 when he drew Batman, it actually looked pretty good! But Superman’s new power wasn’t the only big thing about Superman 38, so was Superman’s big reveal to one of his friends. Yep Clark told his good pal Jimmy Olsen who he really is. That panel was great! Clark just does a quick change and drops the bomb like that. I’m really glad they went in this direction. The whole Clark’s friends not knowing who he is, and playing this game of cat and mouse gets old pretty quick, so to have one person at the Daily Planet know who Clark really is, is great. And I’m glad it’s Jimmy as well, I’m all for Jimmy playing a larger part in these stories. Jimmy really brings out the humanity in Clark, and keeps him grounded. And it will be interesting to see what Jimmy and Clark get up to now that Jimmy knows…even though Lois doesn’t know. I’m seeing some potential great team-ups about to happen between the pair, which according to the description of Superman 39 we will be seeing now that Superman is going to be human for a day with the loss of his powers. Oh and once again that mysterious guy in the hood popped up at the end of the issue. What the heck is this guy up to? And who is he? He’s watching over Clark like a proud dad. Pleaseeeee don’t be Jonathan Kent. Nopee. That would be weird if Pa Kent suddenly went all “oh I’m a mysterious hooded guy that watches over my son very creepily even though I’m dead”. It’s clear that the person watching over Clark knows him somehow, but lets just leave Pa Kent resting in peace. Overall I think this is the strongest issue of Geoff Johns’ New 52 Superman run so far. Finally things have really picked up the pace, the current arc has wrapped up, there is a new power, and a changed dynamic between Jimmy and Clark. And Clark Kent is back at the Daily Planet. 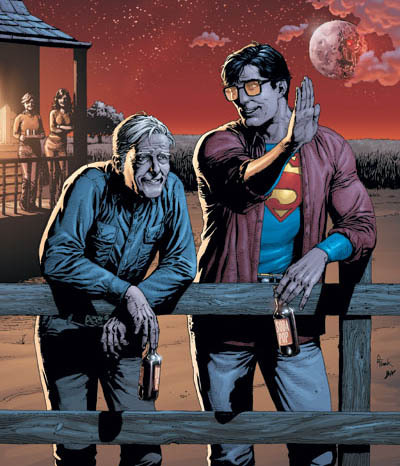 It’s great that the story has started focusing more on Clark Kent’s personal life and the people around him. Lets not pretend that Clark is this massive loner, he has a great circle of friends close to him which really make and develop his character, so I think it’s important to showcase that. The art was looking better in Superman 38 as well…or maybe I’m just getting used to it. But regardless I’m really looking forward to see what the future issues hold for the Man of Steel. It was so great! I’m surprised to be hearing it’s been getting a lot of hate though. But yeah it’s so great Jimmy knows his identity, that’s going to be fun! DC knew this reaction would come though. 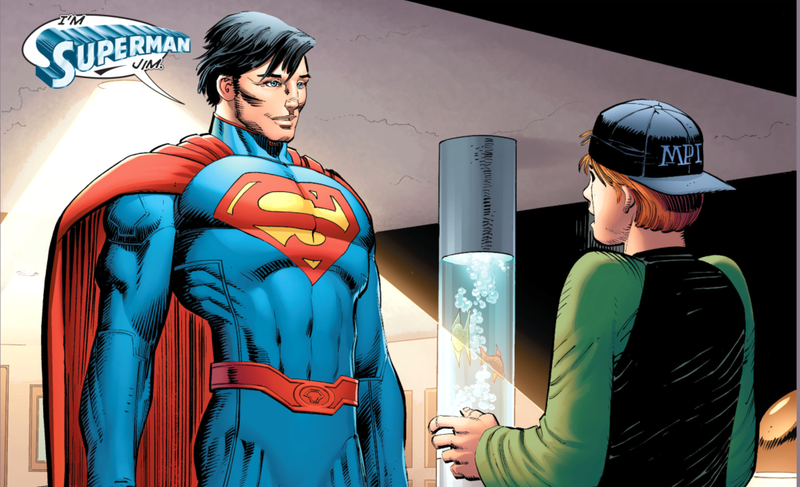 Hyping up a new power for Superman gives new ammunition to the people that dislike the character – and, sadly, he isn’t as popular as he once was. Also, apparently Geoff Johns is leaving the New 52 Superman-run after #39 – I fear that he’ll be dumping the pressure of a new power onto the next head writer. But we’ll see. Good post, btw. I have high hopes for Yang. But we’ll see, first time he’s handling a DC book. Dragonball’s Gokou called from the 80’s – he wants his solar flare power back.